There are a wide variety of conditions that may affect your pet that can cause pain and inflammation throughout the body. One of the most effective ways to combat both of these effects is through the use of Traumeel Pain and Inflammation Relief products. These products include tablets, gels, ointments, and other methods of administering its unique formula to provide relief from pain, bruising, and inflammation in cats, dogs, and horses. These treatments each use mostly natural ingredients to treat muscle and joint pain caused by any number of musculoskeletal conditions. The ingredients are also selected to ensure that the formulation is sensitive enough for long-term treatment. Traumeel also works without causing any adverse affects on the renal, hepatic, cardiovascular, gastrointestinal, or nervous systems. We here at EntirelyPets hope to show both how this product works by looking at its key ingredients and how well it works by looking at reviews from real customers. Aconitum Napellus: This ingredient is toxic in large doses, but provides a numbing sensation to relieve pain when used in a small concentration. Its numbing effects which slow down the heart rate and cool your pet are also used to combat anxiety and fevers. Arnica Montana: A perennial herb, this anti-inflammatory agent has been used by homeopathic healers for centuries. Belladonna: Another medicinal plant, belladonna is used as a sedative to prevent spasms and coughs in afflicted animals. The ointment from this plant can also be used to provide relief from nerve and joint pain when applied topically. Bellis Perennis: The formal name for the common garden daisy, bella perennis is used to treat muscles that have been badly bruised. It’s ideal for providing post-operative care or for treating bruises and sprains. Calendula Officinalis: This herb, also called Marigold, helps accelerate the healing process. Plant pharmacology studies have also indicated that this herb has both anti-viral and anti-inflammatory properties and that it can prevent harmful mutations to your pet’s genetic information. Chamomilla: Chamomile is known to have anti-inflammatory properties and also provides relief from anxiety and spasms. In this solution, it is primarily used as a way to accelerate the healing of surface wounds and loosen stiff muscles. Echinacea (Angustifolia and Purpurea): Traumeel utilizes two different species of Echinaecea to act as antibiotic agents and to relieve muscle soreness. These herbs are crucial in preventing infection of open wounds as they heal. Hammamelis Virginiana: This herb is commonly used in homeopathy to help treat cuts, bruises, and joint or muscle pain. Another anti-inflammatory, this ingredient also works to reduce bleeding. Hepar Sulphuris Calcareum: This natural ingredient combine oyster shells with sulphur to create a tincture which combats infections and is particularly effective at treating boils or other abscesses when applied topically. Hypericum Perforatum: Another perennial herb, this plant produces a tincture that can be vital to treating wounds, lacerations, bites, stings, and other injuries that have potentially damages nerves as indicated by stabbing pain. Mercurius Solubilis: This remedy chemically altered mercuric chloride works to treat a variety of intestinal ulcers and works to treat discharges and relieve pain from bruising. Achillea Millefolium: This perennial plant is used to treat hemorrhages and piercing pain in the wounds that cause them. Symphytum officinale: Comphrey is used to accelerate the healing of bones and can also provide benefits in healing sprains and strains. It is also used to relieve eye pain. Together, these ingredients provide impressive results, with clinical trials showing an accelerated recovery from joint-related injuries. Several independent studies for the ointment, tablets, and liquid formulations of Traumeel revealed that the drug was highly effective at relieving sprains, bruises, hematomas, and other similar problems. In fact, studies also indicate that this treatment can be effective at healing certain conditions in humans as well. "My chiropractor [recommends] this product for people, I have actually used it myself so I know it works for my pets aches and pains as they are getting older." But the product isn’t just for people- Thumper attests to its incredible efficacy when used to treat cats with arthritis. "This product works wonders on cats that have arthritis. It is nice to find something that helps take away the pain and help her walk without suffering." Tracey of Brisbane, Australia, ordered this product for her 12 year-old pooch. "Hi, A friend put me on to these tablets and they are great. They have made my 12 year old dog much more mobile. I am in Australia and the value for money was great. They only took 10 days to arrive. I would recommend Entirely Pets." So then what are you waiting for? 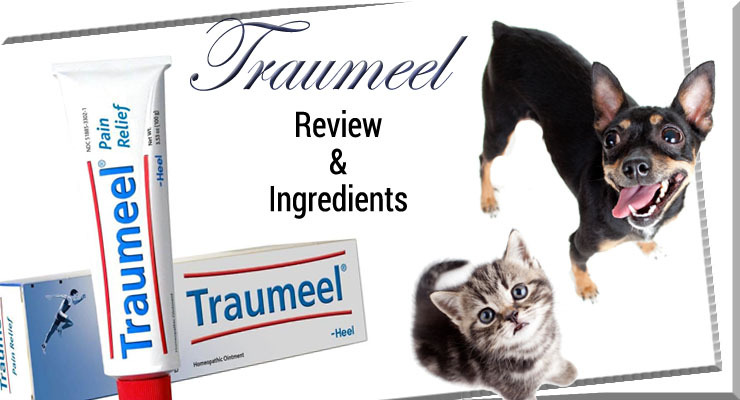 Try out Traumeel in its liquid, tablet, gel, or ointment forms today! Do you have any input on Traumeel that might help other interested shoppers? Share your experience in the comments section below!